Student loans are designed to help learners with different financial backgrounds to easily manage the cost of their tuition. Since college tuition has become very costly in the recent years, students seek to get financial aid in order to pursue college degrees. You can find student loans that are offered by federal government as well as loans by private institutes. The rate of interest, cover as well as repayment options in all these loan programs vary. Most of these loans are granted on the basis of need; some are also given to students on the basis of credit check. What are My Rich Uncle Loans? My Rich Uncle loans were private student loans offered by MyRichUncle.com which applied for bankruptcy protection in 2009. The company had done well initially for having attempted to revolutionize the student lending industry. These loans allowed learners to cover the entire cost of their education in an easy way. They provided an alternative to students who would exhaust their all other financial aids. With the help of a My Rich Uncle loan programs for students, they could get the money for expenses that are not covered by federal loans or other funds. The purpose of these loans was to enable students to realize their dreams regardless of their financial status. Since many students remain deprived of enrolling in college programs because of lack of fund, My Rich Uncle student loans are designed to facilitate students with diverse career goals to pursue degree programs without having to worrying about the tuition and fees. Borrowers are required to return the loan amount they get through My Rich Uncle loans over 10 to 15 year after completing their education. They have to pay a fixed rate based on 0.1% to 0.4% of their gross annual income. As mentioned above, the dotcom went into dire straits and finally filed for bankruptcy with the collateral being this great loan program. My Rich Uncle Loans was discontinued since 2009 due to the worsening credit crisis and its dependence on banks like Merrill Lynch and Lehman Brothers. Q:What kinds of costs can My Rich Uncle Student Loans be used for? A:With My Rich Uncle Student Loans, you can pay for your tuition fees, book expenses, traveling expenses, and even accommodation expenses. These loans are among the most convenient loans available to students. The loans are designed specifically for students in need of financial assistance. However, My Rich Uncle Student Loans are currently not being disbursed. Q:Can you give me some information about my rich uncle loan repayment plans? A:My rich uncle is a lending company that provides student loans for degree programs. These loans are available for undergraduate studies, graduate studies, and other educational courses. Low interest rates among the top features of my rich uncle loans. Apart from low rates, the loans come with flexible repayment plans that keep repayment affordable and manageable. Currently my rich uncle loans are not being offered. Q:Is My Rich Uncle a credible source for getting student loans? A:Many students avail student loans from My Rich Uncle when they have used up federal loans and the money is still not enough to bear the study expenses. My Rich Uncle offers lowered interest rates and the money has to be returned with a fixed rate in a specific duration of time. These loans made a good choice for students looking for financial support until they were discontinued due to financial crisis in 2009. 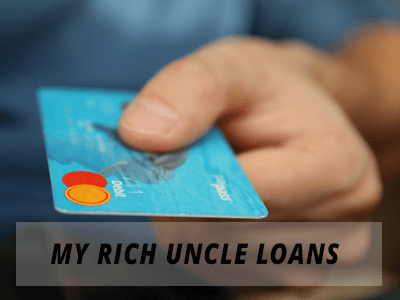 Q:I would like to know how to apply for my rich uncle loan repayment Online? A:One of the greatest features of my rich uncle loans is that they can be repaid once you have completed your graduate or undergraduate studies. the rate of interest if usually fixed on repayment. You can opt for a suitable repayment plan that fits your financial need. For more detail, take a look at our page. Q:I want to find out My Rich Uncle Loans. Are they still available? A:My Rich Uncle Loans were private loans offered by MyRichUncle.com. It filed for bankruptcy protection in 2009. These loans funded students for the entire cost of their education, but they are not available anymore. The business went into dire straits and eventually discontinued giving out loans, when credit crisis worsened.